So today, I thought I would introduce to you all the dogs here on the ranch. I hope I don't forget anyone ;). We'll start with the outside dogs. . . This is Shamrah. She is 75% Pyrenees and 25% Anatolian. We got her when she was a pup from Texas several years ago, and brought her from CA to OK with us. She mainly stays in the front yard around the house and guards us :). Bear is Shamrah's daughter. She was born in 2008 after Shamrah had accidentally been bred by a mutt (oops! they're all spayed now). Bear stays with the goats most of the time. Caleb is my brother, Norayah's dog. We got him when he was a puppy several years ago. He is supposedly a Border Collie/Kelpie mix, but he is pretty big! 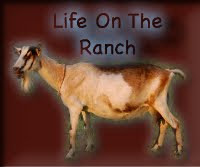 He isn't a herding dog really, just a ranch dog that hangs out ;). This is Jethro. We've had him about a year and a half (I think? ), and when we got him he was about 2 years old. He is a Great Pyrenees. He is a good guardian and he stays with our bucks most of the time. (editing.. I forgot him!) Armor is a big puppy. We got him when he was 6 weeks old, he is now about 5 1/2 months old. He is still growing a lot and I think he is going to be a huge dog. He is growing up with our does and we hope he'll turn out to be a great guardian! This picture is when he was 6 weeks old... don't have a new one. And last but not least, this is Calevah, our 13 year old "mutt dog". We've had her since she was a puppy. She stays out the back door by the milk room and kidding stalls most of the time these days. And now for the "inside" dogs. . . This is Arrow. She is a Bullmastiff that lives in the house pretty much all the time :). My sister Ezriyah used to raise Bullmastiffs, but has pretty much stopped. She has 3 of them - Arrow, DJ, and Canuck. Canuck is only a bit over a year old, believe it or not. We got him all the way from a Bullmastiff breeder in Canada! Canuck was put on a plane and flown to Kansas, where my sister picked him up. He is a great dog. And I don't have a picture of DJ at the moment. . . will have to get one and edit this post. She is Arrow's daughter from her one and only litter (for many reasons). This is Mini. She is my sister Hanunyah's pampered little dog :). And this is Molly. She is Todahyah's dog. Molly is a purebred English shepherd and I think she is about 10 months old right now. She is a very good, obedient, great little farm dog. The internet is being very slow for some reason right now so this took a lot longer than I wanted it to, but praise the Lord. Anyway, more later! You are one of my recipients of the "Sunshine Award." 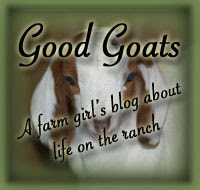 You can check out my blog and read more about it! 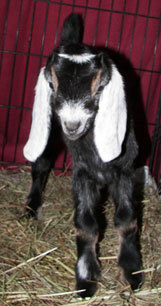 I used to breed mini-nubians. Yours look perfect. 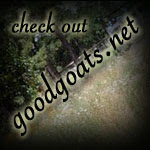 What really nice goats. Mine are now all on exhibit down at the Staten Island Zoo. In my old age, I just breed English Shepherds. Your too looks like a grand dog. Beautiful dogs! 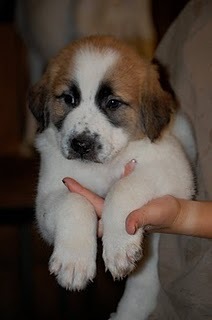 I especially like the Pyr puppy, so cute!